The innovative BTL EXILIS ULTRA 360™ treatment offers many individuals a new way to reduce signs of wrinkles, renew body contours, and rejuvenate their appearance without the need for invasive surgery. 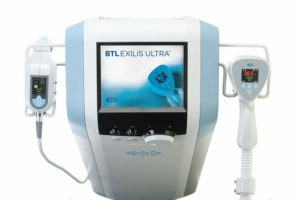 EXILIS ULTRA 360™ technology utilizes a combination of radiofrequency and ultrasound techniques to improve elasticity and enhance skin texture, ultimately helping patients to achieve firmer, more youthful-looking skin. This advanced, non-surgical technique is also capable of diminishing small, isolated fat pockets, and it can even effectively reduce signs of cellulite in certain areas. While surgical lifting and body contouring procedures are both popular and effective ways to significantly enhance one’s appearance, many individuals seek options that can meet their goals without surgical intervention. The EXILIS ULTRA 360™ is the first technology of its kind to simultaneously utilize both radiofrequency and ultrasound waves to effectively address skin laxity and many other common concerns. Our board-certified plastic surgeon, James M. Shaw, MD, and his experienced team here at Shaw Plastic Surgery are excited to bring you this minimally-invasive treatment that is rapidly gaining in popularity. What Are the Benefits of EXILIS ULTRA 360™ Treatment? The EXILIS ULTRA 360™ can also be used as a non-surgical fat removal option for some patients. This option can reduce excess amounts of subcutaneous fat in specific areas that have shown resistance to traditional diet and exercise. In addition, some individuals who are experiencing cellulite in the thighs may also find an effective remedy for this common concern with EXILIS ULTRA 360™ procedures. EXILIS ULTRA 360™ treatment can be an ideal treatment on its own, or it can serve as a compliment to procedures such as arm lift, facelift, liposuction, or other options for the most comprehensive, longest-lasting rejuvenation possible. Dr. Shaw will meet with you for an initial consultation and help you determine whether the EXILIS ULTRA 360™ technique is a good option for your unique needs and goals. How Does the EXILIS ULTRA 360™ Treatment Work? Once you have met with Dr. Shaw and have been designated a good candidate for the EXILIS ULTRA 360™ procedure, a customized treatment plan will be created based on the areas of skin that will be addressed. During the treatment, the handheld EXILIS ULTRA 360™ device will be guided over these areas to deliver both ultrasonic and radiofrequency energy deep into the dermal layers. This targeted energy is designed to stimulate a process that can enhance the skin’s elastin and collagen, diminish excess fat cells, and give the area a firmer and smoother appearance. Another benefit of the EXILIS ULTRA 360™ procedure is that it is designed to minimize discomfort during treatment. You will likely feel a sensation of heat (somewhat akin to a hot stone massage); however, the EXILIS ULTRA 360™ device includes a cooling mechanism to make the treatment safer and more comfortable. This treatment can be performed at our practice rather than a surgical facility, and it usually takes about 15 to 30 minutes to treat each area that is being targeted. Overall, EXILIS ULTRA 360™ procedures can be performed relatively quickly, depending on the extent of treatment and the number of targeted areas. What Can I Expect During Recovery from EXILIS ULTRA 360™ Treatment? The EXILIS ULTRA 360™ procedure does not involve surgery of any kind; therefore, a subsequent recovery period is typically not necessary. In fact, many patients are able to resume normal daily activities right after the treatment. Some redness and irritation can be expected after the procedure; however, these conditions should quickly fade. What Kind of Results Can I Expect from EXILIS ULTRA 360™ Treatment? Some individuals may start seeing noticeable results after just one EXILIS ULTRA 360™ treatment. In most cases, patients will likely need a series of treatment sessions, typically about two to four, staged over several weeks. This can ultimately help patients achieve optimal results from the EXILIS ULTRA 360™ procedure. The results should continuously improve for approximately three months after treatment as the skin’s collagen grows and enhances the skin. Many individuals who have undergone EXILIS ULTRA 360™ treatment achieve results that last for years after the initial procedure. Do you have questions about what EXILIS ULTRA 360™ treatment can do for you? Please contact Shaw Plastic Surgery today for more information, or to schedule a consultation.